Dimensions 13 ½ W x 12H x 3 ½ D in. Great for traveling, work and school, these custom messenger bags are a favorite among our clients. Available in accent colors that include, blue, gray and red, these imprinted messenger bags feature an adjustable padded shoulder strap, a side mesh pocket for water bottles or other drinks, a side media pocket, front zippered pocket, inside organizer compartment for pens, calculators and business cards with Velcro closure and two inside zippered pockets for extra storage. Our wholesale laptop bags can be imprinted with your custom logo and graphic design. Get them in time for your event and distribute our laptop bags amongst your clients and employees. 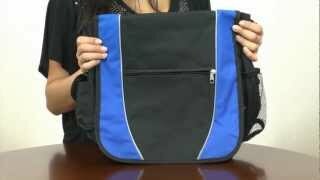 With great features our custom laptop bags are sure to get your business noticed. Contact us today should you have questions about our messenger bags or any of our other promotional items. 100 times better than they look in the picture and the girls love them! Its everything we expected. Our students will love them. This is the 2nd time we ordered from Discount Mugs. Great products and prompt delivery. Awesome customer service. Big thanks to customer representative Lizel Kalaw. To my sursprise, the bags look really great!